Over at Gpara they’ve covered the news that an old Temjin statue will go on tour around three Japanese art museums in the coming months. Specifically the Aomori Museum of Art, Shizuoka Prefectural Museum of Art and the Iwami Art Museum. This is also part of a robot art festival but it nicely ties into the upcoming release for the Virtual On Force port coming later this year. 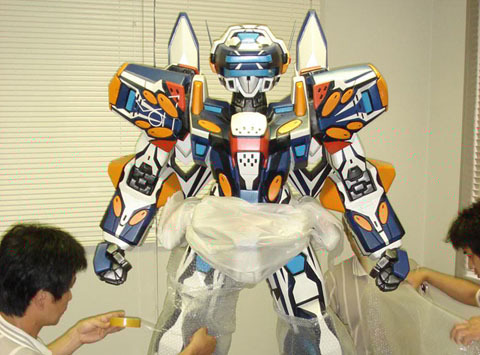 This specific Temjin statue, the MZV-747-J, was actually used at the 2002 Tokyo Game Show to announce Virtual On Marz’s release. The problem is that the 747 series of Temjins in Force sport a different and more subdued colour scheme, so this statue is a bit out of date with that really. This Temjin from Marz also featured in Super Robot Wars Alpha 3 on the PS2 and the recent Super Robot Wars K on the DS. 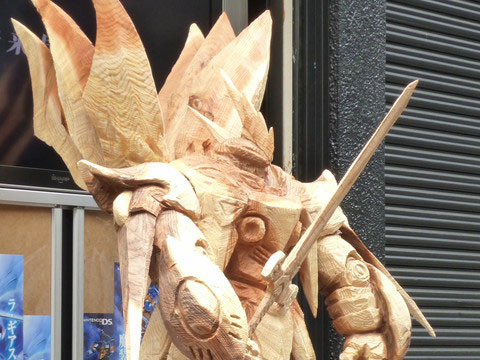 To commemorate the release of the updated port for Lord of Elemental, Banpresto commissioned a wooden sculpture (etched via chainsaw no less by a masked chap called Jason-san) of the suitably regal Cybuster. Game Watch has covered this quite nicely and shown the statue from a number of angles. Whilst the finish isn’t overly precise, it does have a rather lovely rustic feel to it. To me at least, that fits the whole Byston Well-eqsue nature of the design. In any case, the game itself is released today in Japan and you can order it here. Earlier in the week, Game Watch had a nice bit of coverage over Lord of Elemental’s game system. Despite mentioning how the Prana setup worked, which acts as a boost to your HP and MG, the Guardian relationship was also laid out. Specifically, how the elemental side of this setup works – this is also where the game takes its name from in case you’re wondering. In short, the four elements of wind, fire, earth and water act as defensive and offensive multipliers. Thus far, the system of the game seems to be pretty cogent and whilst it has been updated from the original game it doesn’t appear to be detrimental (though we’ll know for sure once we have it in our hands). For those that buy the game on release they’ll also get a free OG Crusade card for their troubles too. The game is released on May 27th for 6090 yen and you can pre-order it here. Tail Concerto‘s new spiritual sequel for the Nintendo DS, Solarobo, has had three short gameplay demonstration movies released as well as some nice coverage over at Game Watch. While their brevity (and the lack of sound) doesn’t tell us too much about the game, what we can see does inform us that the game is coming along nicely. 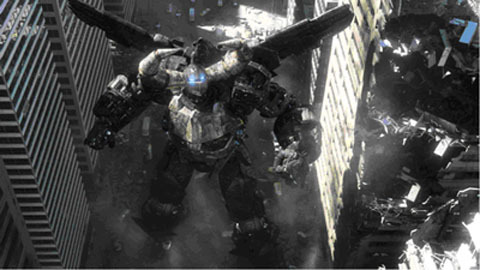 The promotional art’s almost ‘watercolor’ style seems to have very much inspired the game’s current 3D graphics, and the character designer, Nobuteru Yuki, has not only done character designs for video games with similar ‘watercolor’ graphics styles (most notably a few games in the Mana series), but also has worked on mecha-oriented productions before, most notably Visions of Escaflowne and Five Star Stories. From the gameplay previews here we can also see that the camera angle changes in response to different gameplay needs. A few sections look much like any other 3D game on the Nintendo DS with an overhead view, while other sections make the game look more like an old PlayStation sidescroller instead. Hopefully this willingness to experiment will create a unique flavor for the already somewhat crowded Nintendo DS platformer market. We also see the character leave the confines of his mecha to do some exploring on his own, which is something that, when done well, has led to good things in the past by making the difference between mecha and man (well, animal man in this case) more obvious. 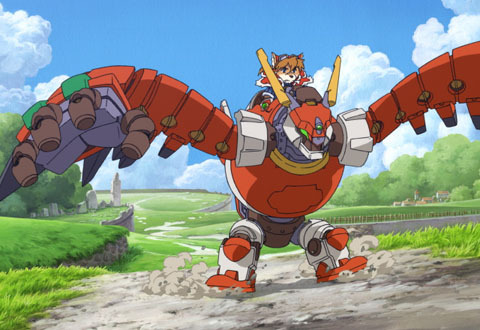 The mecha itself has a unique design, looking as much like a bird as it does a mechanical man, with arms that remind me of the robots both from Laputa: Castle in the Sky and from Tokobot. Those same arms seem capable of stretching a great deal in the gameplay videos, even allowing continuous “combo” throws of enemy mecha. Over at Game Watch they have a nice new breakdown of the Lord of Elemental DS port. Covering all the main characters and their respective mecha. The official site has also received an update and what’s most interesting for us, is that the original Super Famicom music is playing in the background. This may mean that the original maybe intact in the DS port, with any luck at least. The only concern we have at the moment is that the “System” part of the site is still under construction. Now, we’ve already had a fair few Super Robot Wars games on the DS, all of the pretty well wrought too. However, Lord of Elemental’s setup was intentionally quite straightforward for the time. Whether that’s retained or updated somehow is still very much unknown. The game is still set for a May 27th release in Japan at 6,090 yen and you can pre-order it here. Still no word from Atlus on whether this will be released in the West though. This has been going the rounds as of late, as it seems that a live action Gaiking is in production. The teaser trailer shows that, much like Michael Bay’s recent Transformers films, this Gaiking remake is massively over detailing its designs. The reasoning behind this is obviously because some muppet thinks that this makes the mecha look more realistic; the problem is that they picked Gaiking. Gaiking is a super robot with MASSIVE horns on its head and a giant mouth in its chest. I mean, honestly, it’s hardly a realistic place to start. Yet going to all that realistic detail in the cockpit and all the visual kibble adorning the mecha’s body is utterly missing the point. At least with the recent animated sequel a few years back they managed to at least get the tone right. This just looks very silly, simply because it’s taking itself desperately seriously. Super robots are meant to be preposterous fun, making them realistic just makes it all very dull. Gaiking was also one of the mecha mecha in the Shogun Warriors toys/comics line. These were basically a means to sell totally disparate Japanese mecha toys from separate series all under one line back in the late 70s and early 80s (a bit like a super robot version of Robotech). The only heartwarming thought about all this is that Go Nagai might get to finally see some Gaiking royalties if this is actually made. The original Gaiking and its recent sequel have also been featured in numerous Super Robot Wars games over the years. Our personal favourites are Super Robot Wars Alpha 3 and Super Robot Wars K. Both games come highly recommended. Thanks to Plastic Pals for the heads up. News: Tail Concerto Resurrected as ‘Solarobo’? This is one of those things you just don’t think will ever happen: Tail Concerto, a mecha platformer on the original PlayStation with a cult following, is apparently getting a sequel (of sorts) entitled Solarobo Sore Kara Coda E for the Nintendo DS (made by none other than CyberConnect2, the developers behind the .hack and recent Naruto games – not to mention being the team behind the original Tail Concerto). The original Tail Concerto was extremely cute and what we know about Solarobo so far suggests that the game is going to be taking place in an equally cartoonish world, full of talking cats and dogs, so those of you expecting to go on a grimdark cyberpunk mecha adventure on your Nintendo DS might need to rein in your expectations a bit. However, the artwork and screenshots (kindly ignore the huge splash image there) we’ve seen are good enough for me to temporarily cast aside my general rule against Talking Humanoid Animals (Who Aren’t Also Ninjas). While the cute look might turn some people off, the original Tail Concerto is generally well-regarded as a good, if a bit short and simple mecha game and I for one welcome different kinds of art styles within the mecha genre. If only because with different art styles come drastically different rule sets, which add vitality to the very specific genre of ‘mecha games’. Sometimes, playing as a bubble-shooting steambot mecha piloted by a canine cop is just what you need between bouts of emotionally-sensitive teenagers inexplicably in control of billion-dollar pieces of military hardware to keep the mind fresh. 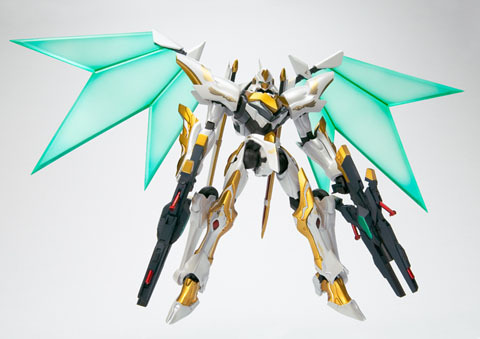 Bandai have announced a new range of toys helmed by Hajime Katoki, hence the “Ver. Ka” suffix (as that stands for “Version Katoki”). 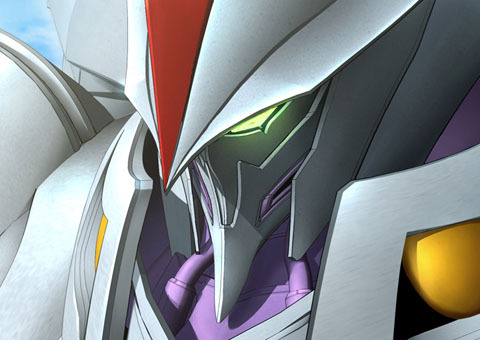 The first in the line is the Lancelot Albion from the second season of Code Geass. Admittedly, there was a Robot Damashii variant of this design already but it seems that this version will be bigger and far more detailed. As far as games are concerned, both the original Lancelot and the Albion upgrade were only really featured in the somewhat lacklustre Code Geass adventure games that were released on the PSP, PS2 and DS. The mecha haven’t been given an action game as yet nor featured in something like Super Robot Wars. The mecha design in Code Geass was actually penned by the gaming luminary Yasuda Akira, or “Akiman” as he is more affectionately known. So having his work re-touched by another gaming mecha designer, in the form of Katoki, might be a little strange for him maybe (though Katoki is admittedly respected by other artists, despite his somewhat frosty demeanour). The next Ver. Ka toy in this new line will be the indomitable Gurren Lagann, which is briefly previewed at the bottom of the page linked above. In any case, this new Albion toy will be available in June for 5040 yen and you can pre-order it here. 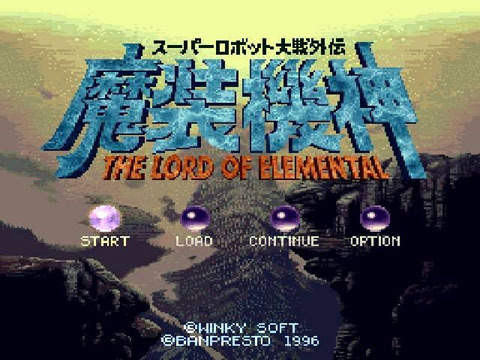 The upcoming DS remake of the Super Famicom game (screenshot above), The Lord of Elemental, received its first trailer. It’s clear that this is not just a straight port either, as it’s very obviously been given a graphical facelift to bring it into line with the last few DS SRW games. Famitsu also has some nice coverage of the game as well. It’s worth also mentioning that the original game was thematically quite similar to Aura Battler Dunbine, with the ethereal Cybuster bearing an uncanny resemblance to Sirbine – an aura battler from one of the Dunbine OVAs. Even the original box art to Lord of the Elemental looked much like one of Yuji Kaida’s model kit box covers. The in-game footage below does look promising though and it’s nice to know another decent SRW game is on the way to the DS, as Gakuen was rather disappointing and Frontier Exceed was just a pointless moegasm. 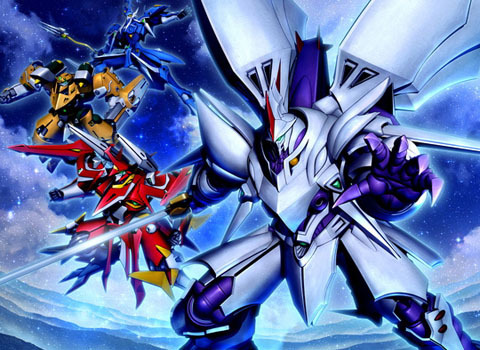 The first ever Original Generation focused Super Robot Wars game is getting ported to the Nintendo DS. 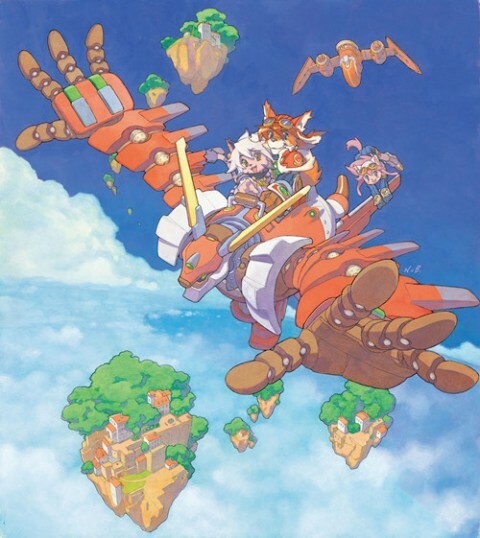 Specifically, the Super Famicom entry of The Lord Of Elemental. This was an interesting SRW game on many counts, such as exclusively featuring OG mecha as well as rendering them at actual size (not in SD). Not to mention the oblique viewing angle, seen in many SRW games since. It’s also a game that many older Japanese gamers view with a fair amount of fondness, as the original game was released almost 15 years ago now. It seems that Banpresto are shrewd enough to cash in on nostalgia and port an already existing title to obviously fund the development of other projects. In any case, due to this being an OG title there’s an excellent chance it will receive a Western release. The game will be released in Japan on May 27th for 6,090 yen.